The Ministry of Education of Rwanda encourages parents to actively participate in their children’s education. They want to see this participation translated in terms of material, technical or moral support to the school to which they entrust their children. Within this context, parents whose children attend the primary school of Munyinya have been asked to find a solution for the captation of rain water. Being poor, they lack the necessary means to respond to the multiple needs of the school. 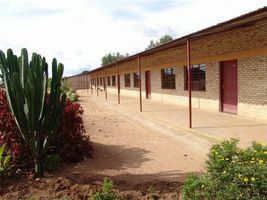 Donations to the school have stopped with the sudden decease of a Swiss benefactor Marguerite Fuchs, who funded the improvement of the school’s infrastructure. Her generosity deserves to be continued. Parents and children, we all believe and hope her example will be followed. The idea to start a project came to my mind during my visit to Belgium where I was invited by my friends from the Association “Vleugels van Hoop' what means 'Wings of Hope “in September 2007. They were enthusiastic and confirmed their support during their visit to Rwanda in January 2008. 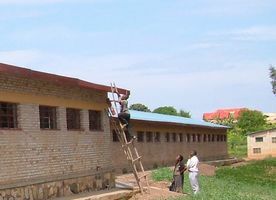 The Munyinya School is one of the primary schools in the district of Muhanga in the Shyogwe sector, located in Cellule Rule near the Munyinya hill at 300 m from the main road Gitarama - Kigaly. Realization of the project will allow a more efficient housekeeping of the school. Students and teachers will have the immediate benefit. But we also want neighbors of the school, especially those in charge of security during our absence, to also benefit as recognition for their efforts and as a token of good neighborhood. 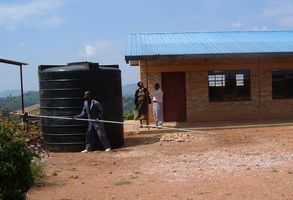 The installation of a water reservoir will relieve the teachers’ burden considerably as they now anxiously wait every Friday afternoon for the children to return with large quantities of water from the source needed for cleaning. It would be less of a nuisance for the adults who cannot draw water from the source until the school children have finished fetching water. And it would stop the accusations made against imprudent kids who inadvertently destroy crop in the area around the source.